Treasury wared of the negative economic effects from the mere prospect of default if Congress again engages in the kind of brinksmanship that occurred in 2011. The United States has never willfully defaulted on any of its legal obligations. So the consequences of doing so are unknowable. But the general consensus is that it could be catastrophic. Or, in the best-case scenario, seriously damaging to the economy. 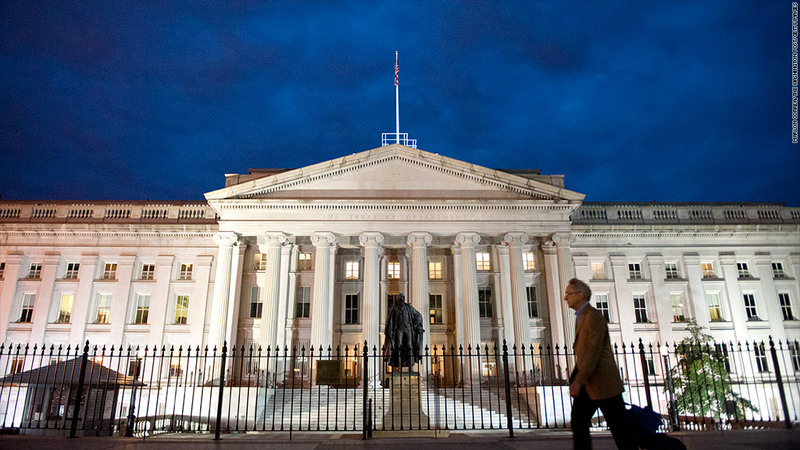 "Political brinksmanship that engenders even the prospect of a default can be disruptive to financial markets and American businesses and families," the Treasury Department said in a report released Thursday. Treasury Secretary Jack Lew has told lawmakers that the need to raise the ceiling is becoming urgent. The country reached the debt limit in May. Since then Treasury has been using special accounting measures to keep borrowing just under the limit. Lew has said those will run out no later than Oct. 17. At that point, Treasury won't be able to borrow and will have only two sources of money to pay bills: The estimated $30 billion cash that Lew expects to have on hand, plus whatever daily revenue that comes in. The problem: There will come a day -- possibly as soon as the end of October -- when those won't be enough to cover all the bills due on a given day. So far, Congress has shown no signs of raising the ceiling, which stands at $16.699 trillion. The Treasury report is based on what occurred during and after the 2011 debt ceiling fight. That fight ended with a last-minute increase in the nation's borrowing limit. Congress averted default but provoked a credit downgrade. "Consumer and business confidence fell sharply, and financial markets and job growth slowed," the report said. Immediately after the downgrade, stock markets plummeted for a time, volatility jumped and credit risks widened noticeably, it added. So in the event of default, it's not unreasonable to expect those kinds of effects and more. Treasury noted that "many private-sector analysts believ[e] that it would lead to events of the magnitude of late 2008 or worse."